LOS ANGELES (AP) — Dodgers outfielder Andre Ethier officially announced his retirement from baseball Friday during an on-field ceremony. Ethier played all 12 of his major league seasons with the Dodgers, making his debut in 2006, less than five months after he was acquired in an offseason trade from the Oakland Athletics. He hit 162 career home runs with 1,367 hits and appeared in the postseason eight times. He drove in the team’s only run in a 5-1 defeat in Game 7 of the World Series last year. Ethier, 36, said he was open to joining a team in spring training but the perfect fit never materialized. By April he started planning his first summer family vacation. The Dodgers talked him into a retirement ceremony Friday. 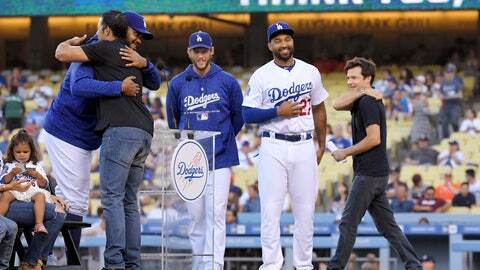 The emcee for the retirement was actor and Dodgers fan Jason Bateman. A broken leg and an injured back limited Ethier to just 38 regular-season games over the past two seasons. But he made it back to make the postseason roster each year. In addition to his Game 7 RBI in last year’s World Series, he managed to hit an NLCS home run each of the last two years. Dodgers players Joc Pederson, Matt Kemp, Clayton Kershaw and Justin Turner were in the cramped media room to hear Ethier speak before the game. Ethier admitted that he would love to still be playing. Kemp also made his major league debut in 2006 and he and Ethier roamed the outfield with each other for nine seasons. Ethier reserved his most sentimental words for his longtime teammate. “If I could do one more thing, it would be to play one more game with Matt,” he said.